Decisions, choices, courage, truth, preparedness, confidence. 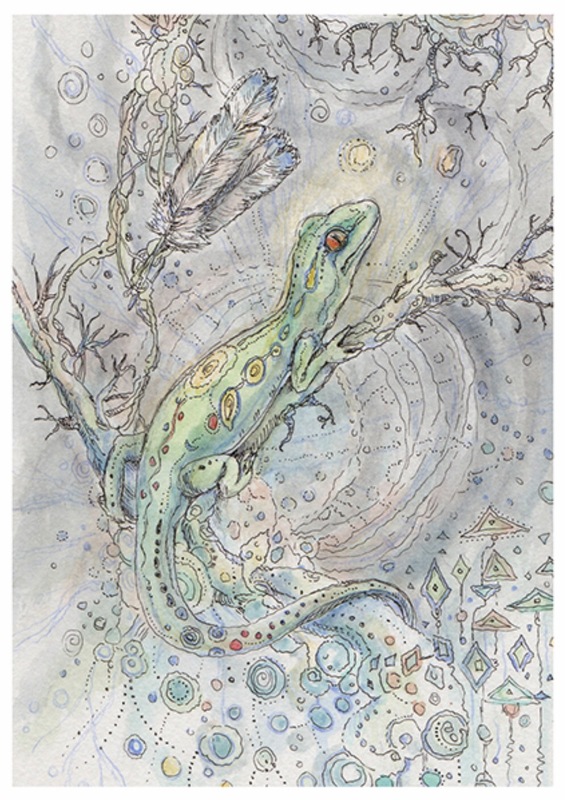 Peaceful Gecko is adept at moving between the worlds of the subconscious and the conscious. She taps into a balance of forces to clear the mind, bringing truth to light, She’s accustomed to facing fears, and is preparing herself to choose the direction in which to go next. Gecko reminds you that you have the power to unleash the energies needed that work toward delivering a clear outcome in decision-making. Speak your truth, and do not allow fear to hold you back. Open your eyes so that you may see your options more clearly. Seek solutions from within, and have patience with yourself. There will be a knowing within your higher-consciousness when it is time to act. This entry was posted in Artist, Deck Review, Featured Card of the Day, General Tarot, Readings and tagged 2 of Feathers, Gecko, Paulina Cassidy, Spiritsong, Tarot.